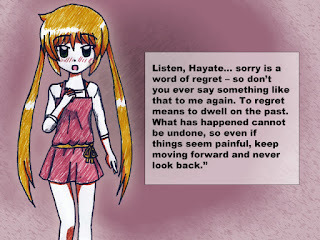 Synopsis: Okay, so everyone except Hayate have no effin clue as to where the place is in the riddle. Ah, she's so lovely... even from behind. Nagi: We'll know the way if we can figure out "the meaning of love," right? Past Athena: Do not touch this coffin. On the hill of calvary stands a castle inhabited by a God. The Royal Garden the place where it begins and ends. Hayate's back at the Sazenin Mansion. He's still wondering about that riddle. Hayate: There's no effin way, right? Such an important thing in that place? Hayate: I mean, how are you supposed to get it then? Flashback Isumi: Ya need a King's Jewel and Negative Emotions, fool! Hayate: I gotz 3 stones! Hayate: No no, this is unreasonable. Can't resist this smile can ya, Hayate? Flashback to Hayadad/Shun Ayasaki: Oh, you didn't steal anything Hayate. I DID for teh lawlz! 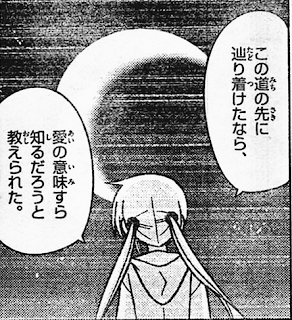 Hayate: But unless something shocking happens, the road to the Garden won't show itself. 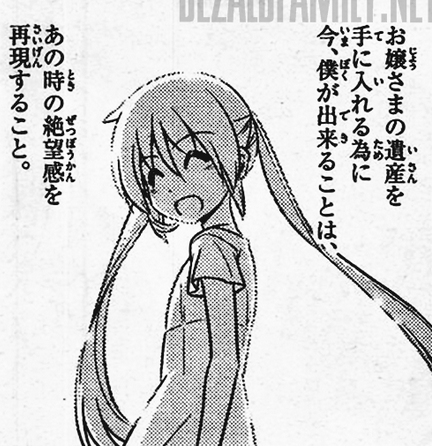 Hayate: They (Hisui and Yozora in Hayate's mind) still don't have a King's Jewel, so the advantage is with us. Hayate: It needs to be something shocking like that time dad betrayed me 10 years ago. Hayate: For ojou-sama's inheritance, I must reproduce such a negative feeling. 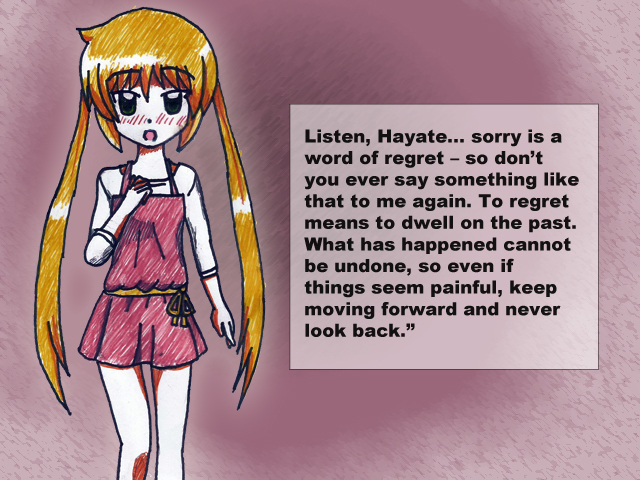 Hayate: The possibility isn't zero. I have the stones. Hayate: I need a heart-stopping shock! Hayate: Only then will the road surely open. Hayate: So now I gotta find a shocking event by all means! Magazine on his hand: Suirenji Ruka's Affair! At that time, an event shocking enough to open the road was happening. Hayate: Eeeeh? Eeeeh? What is this? Hayate: A locked room date at night with some company president? You've gotta be kidding me. 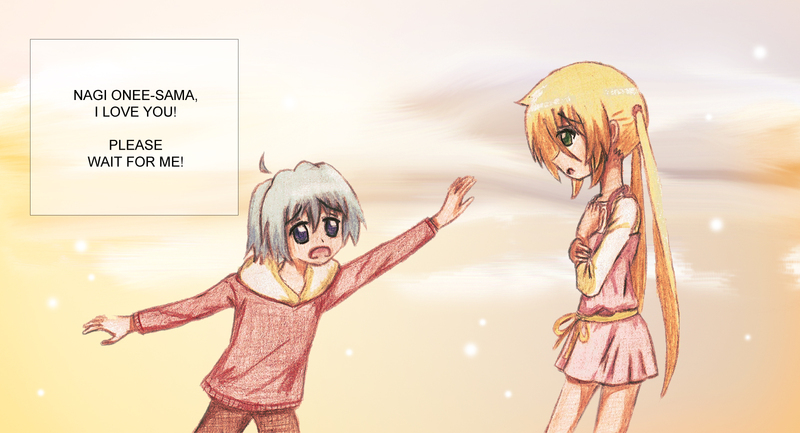 Hayate: Well, it doesn't really matter whether it's the truth or not but. Suddenly, a wild panda appears! Panda grabs Hayate by the head and drags him to the violet mansion. 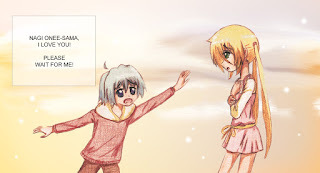 Hayate: Oh, Ruka... it's been a while..
Ruka: YES, It's been awhile... ARE YA FINE? Hayate: So... what was groundless? Hayate: Ah yeah, I was a bit shocked but... as expected, you really are popular, ain't ya? Ruka: I'm not having an affair! Hayate: Oh, is that soooo? Hayate: Well, it's fine, isn't it? Whether you're having an affair or not. You're free to love after all. Ruka: THAT's NOT IT! THAT GUY IS MY GRANDFATHER! Ruka: That's right! He's family! Chiharu: Yo, the weekly magazine says that Ruka is in big trouble! Ruka: Like I said! It's a misunderstanding! Review: Um yeah... well, Ruka's back... that's nice, isn't it? With that said I think this is a red herring -- what I mean is that Ruka won't be the candidate to open the path to the Royal Garden, since really... her problems seem a bit too comedic and thus trivial to be as serious as the example Hayate keeps mentioning about his dad betraying him. Anyway, we have Hayate confirming even more in this chapter that he'll stop at nothing to get Nagi her inheritance -- which she doesn't seem to care that much for. Also, he now needs to get into the Royal Garden because according to him, that's apparently where the key is based on that riddle from the Hakuo Clock Tower bluprints. So for most of this chapter, Hayate is contemplating how he's going to commit murder in order to produce a shocking event that will open the Royal Garden and allow him to grab the key and ensure Nagi's inheritance... nah, just kidding about the contemplating murder part... mostly. What else? Well, Ruka is back and entering the fray in a full-body costume has really become her trademark. Also, it was pretty funny how she managed to drag Hayate all the way to the Violet Mansion while in that heavy costume. She's also as fun a character as ever. 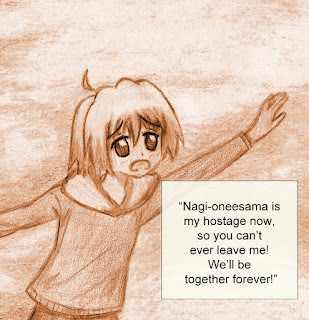 Meanwhile, some really nice shots of Nagi in this chapter, although she doesn't appear much. Speculation Corner: Ya know, if Ruka's scandal thing becomes another subplot and is somehow connected to the main plot, Hata could potentially drag out the manga for good two years or so. Fanart Corner: Well, instead of my usual fanart, I invite you guys to check out some new projects I started. What If: This is a Hayate no Gotoku! Alternate Universe fanfic. No Athena, no Tama,no Klaus, just Hayate, Maria, Nagi and Hayate's parents. The twist is that Nagi is 13 while Hayate is 10 years old when they first meet. Currently up to chapter 2 of a scheduled 4 chapters. Check it out on wattpad as well if you prefer to read from there. 365 Nagi: This is a daily photo project where I take a photo of my Nagi doll/s for 365 days. I was invited by a friend from the VN Dev Circles which I used to be a part of some century ago, so check out 365 Kei and the other 365 projects as well. 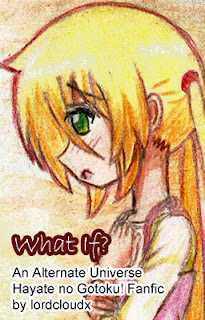 Here's some of my fanart from "What If"